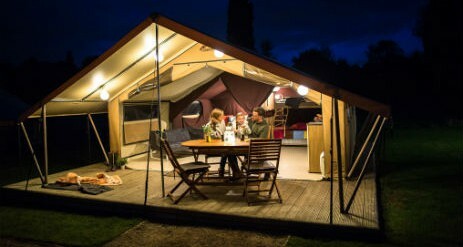 Welcome to Normans Bay, an amazing beach glamping holiday right on the East Sussex Coast! 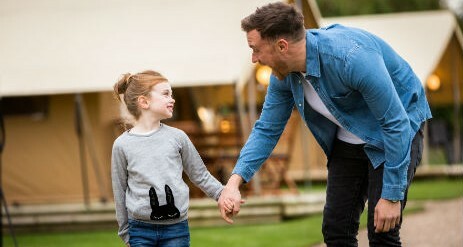 Here, you’ve got all the best ingredients for a family glamping holiday: local seaside resorts, a huge beach on the doorstep, battle-scarred heritage attraction and nature walks. 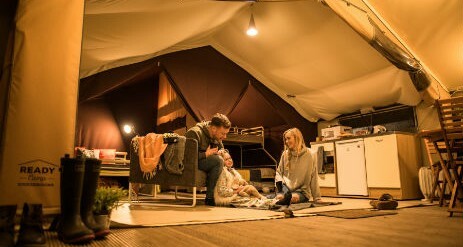 After a long day out with plenty of fresh sea air, spend your evenings cosied up in your canvas-wrapped haven. 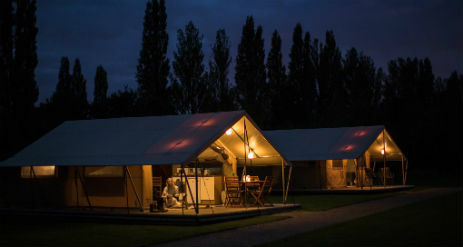 Each tent is complete with full beds, a lounge and dining area, a mini kitchen and your own terrace which is perfectly lit for night time relaxation. You will find all that you need whether you choose to stay for a short break or longer holiday, all you need to bring is your own bedding and essentials to get your holiday started! There is also a shower block and washing facilities on this site itself. 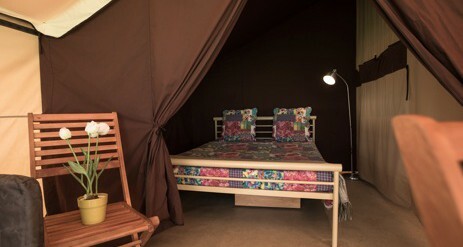 (Please note that pets are NOT permitted in our Ready Camp tents). 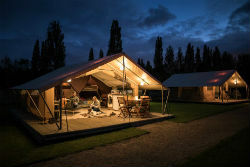 Normans Bay and glamping holidays go together like beaches and sandcastles; it just feels right. There are beaches galore in this part of the world, from quiet stretches of sand and shingle to the bustling seaside resorts of Eastbourne and Bexhill. Visit the quaint old town of Hastings and take a walk along the Pier, ride the Victorian funicular railway up to Hastings Country Park, and explore the haunting ruins of Hastings Castle. There’s plenty there for your to see. If you like walking, then put on your hiking boots and explore the 1066 Country Walk, following in the footsteps of William the Conqueror! And something for your ‘must-see’ list is a visit to the magnificent Herstmonceux Castle. It’s a spectacular medieval attraction with gorgeous gardens, woodland walks and heavenly tea rooms. Drusillas Park, with it’s wonderful wildlife, is a place your children will love! And for children of all ages, you will find non-stop entertainment in Eastbourne. 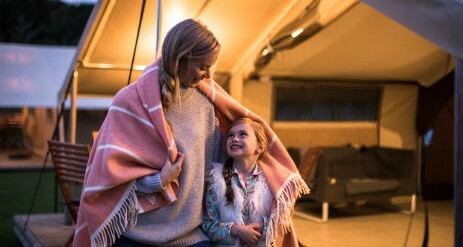 Here, you can take a boat trip, try your hand at watersports, go rock pooling and fossil-hunting, walk to Birling Gap, ride the miniature steam railway… or simply kick back on the sands. Wow, what a fun packed day out!